Primitive dolls are modeled after cloth dolls that were played with on the American frontier. These dolls were considered more practical for play than china or clay dolls due to the inexpensive nature of the materials used in their construction, and the durability of the dolls themselves. Some of the oldest dolls in the world are cloth dolls. Ancient Egyptian children made dolls out of linen and stuffed them with papyrus. On the American Frontier, dolls would be made of whatever material was available. A doll might be made of corn husks, feed sacks or scraps left over from old clothes or quilts. This is why primitive dolls are more famously known as "rag dolls." 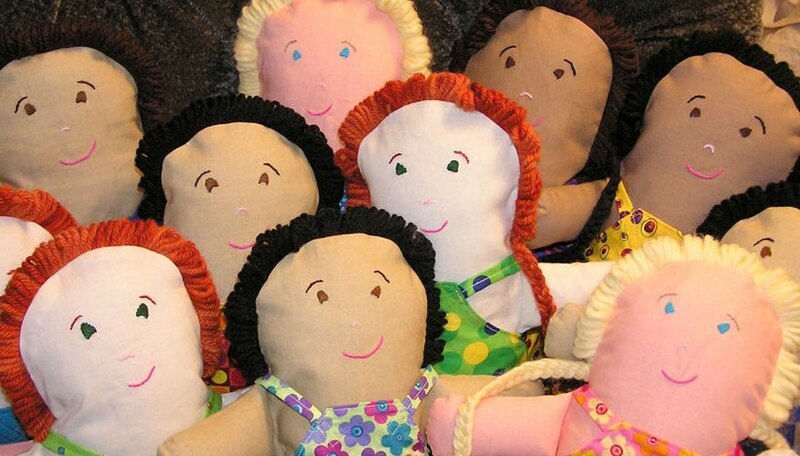 Modern versions of primitive dolls are made using homespun fabrics. Buttons may be used for features, or they may incorporate natural materials such as nuts or cinnamon sticks. Although the rag doll's body could be sewn and stuffed with cotton, straw or hay, another common technique for making primitive dolls is to roll strips of cloth and tie them. Heads, hands and feet can be created by tying the ends of the rolls to form the wrists, necks and ankles. Other features, such as fingers, mouths or eyes, may be left blank, painted or stitched on. Stitches are often imprecise to give the doll a homemade look. New primitives are often given an artificially aged appearance by soaking the doll's fabric in tea or fraying the edges. The most common form of primitive doll body that you can sew is the pancake, or outline, body. To make this type of doll, cut out the doll body in the shape of the doll itself. You can cut each side of the doll's body out of two separate pieces of fabric or fold the fabric over and cut the body so that both sides form one piece that joins along an edge. You then sew the edges together leaving a small opening to turn and stuff the doll's body. Next, you clip the curved seams, turn the body inside-out, stuff it and sew the opening closed. Do not worry about being precise in your doll's construction. One of the characteristics of primitive dolls is that their appearance is crude, as if made by unskilled craftsmen. Clothing can be made in a similar fashion. Popular clothing for primitive dolls includes dresses and overalls.